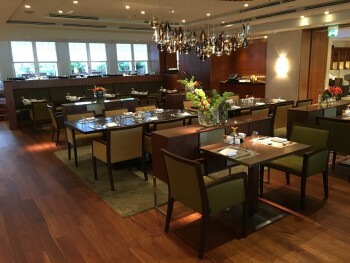 This is my review of the Park Hyatt Hamburg hotel. There are only two hotels in the world that I book by default whenever I have to go to that city. One is the InterContinental Le Grand in Paris which as I wrote here is, perhaps surprisingly, my favourite city hotel in the world. 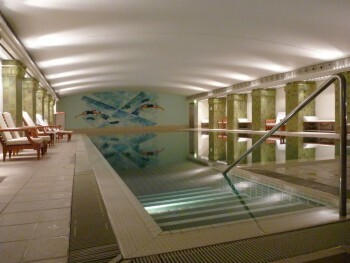 The second is the Park Hyatt in Hamburg. 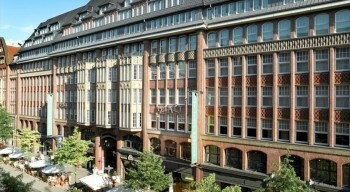 The Park Hyatt in Hamburg has a reputation which belies its position above a small shopping arcade on the main retail street. Part of the reason I stay here, admittedly, is practical. It is two minutes walk from the main railway station (not that you would know it – imagine if Kings Cross was at the top of Regent Street and you have Hamburg) which is where the S-Bahn from the airport drops you. My daughter was off to her grandparents for a week and the agreed handover spot was Hamburg railway station. I could have dashed back to London immediately but the chance to spend a couple of hours in the shops and the redeveloped harbour area meant I stayed over. There is still an outside chance that they may finish the new Herzog & De Meuron concert hall before I retire ….. This was a good opportunity to close a long chapter. Over three years, I have managed to earn 10 nights of stay credit in Hotels.com Rewards. If you stay with lots of different hotels chains and struggle to focus on any one in particular, Hotels.com Rewards may work out better for you than a chain-based loyalty scheme. I will explain why in a separate article tomorrow. My ten nights credit qualified me for a free night to the average value of my 10 stays. Three of these nights were complimentary for doing a series of surveys for the company ($200 nominal value each), three came from my suite at the Four Seasons Las Vegas in 2014 and the others were random non-chain bookings. The net result of this was £185 of free room credit. 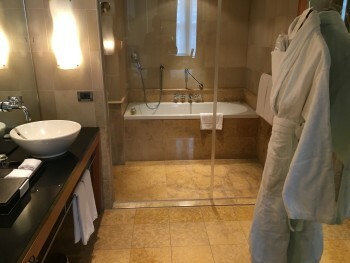 Luckily, this was almost exactly enough, excluding taxes and charges which must be paid in cash, to book a Deluxe Club room at the Park Hyatt Hamburg. 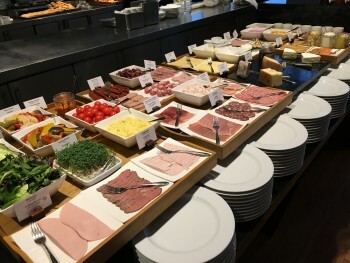 US points blogger Gary Leff likes to use the phrase “I am not my rate”. What this means is that a hotel should respect a regular visitor irrespective of how they book, and the Park Hyatt Hamburg did. I would not have usually booked via hotels.com because I like to pick up my Gold Passport points but in this case it was obviously necessary. It is hard to explain why Park Hyatt Hamburg ‘works’ but it does. The hotels is very well run and the upmarket shopping arcade on the ground floor, plus the fact you exit directly onto the main shopping street, means the location is very handy. At the same time, because reception is on the 2nd floor, there are very few members of the public randomly wandering in for a look around. It came with L’Occitane toiletries. There was also a good desk, LOADS of lights (often a problem in continental hotels), decent wi-fi and a Nespresso machine. I could happily have lived here for a week. 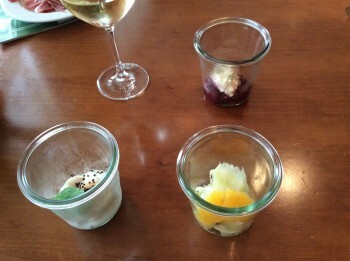 Seven jars (four mains and three desserts), some bread and pate, some ham, some wine and a coffee later and I was done! 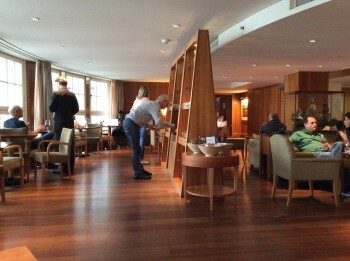 The only odd thing about the Park Hyatt Hamburg lounge is that the lounge is not in a dedicated room. Anyone can go up to the 7th floor and walk into the lounge area. I was never asked for my room number, even during meal service in the evening. There isn’t even a reception desk – and there wouldn’t be any point, as the whole lounge is ‘open’ anyway. 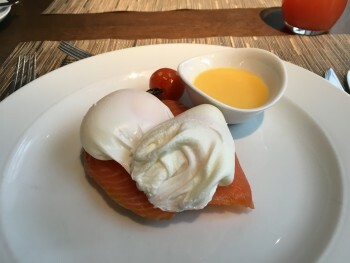 I was offered the choice of taking breakfast in the restaurant. I’m not sure if this is a general club level perk or something I got because I am a semi-regular visitor or because I have Hyatt Gold Passport Platinum status. 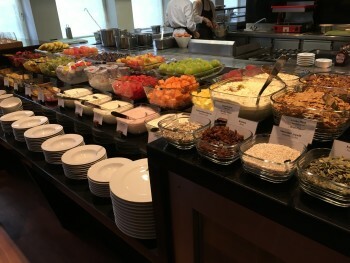 As this is one of the best breakfast buffets you will see outside of a resort, I jumped at the chance. I thoroughly recommend the Park Hyatt Hamburg. If nothing else, there is free flow champagne for breakfast, at least at weekends, and any hotel which does that can’t be bad! As a way of using the Hotels.com Rewards free night which had been niggling away at me for the three years it took to pick up the 10 stay credits, I really can’t complain. 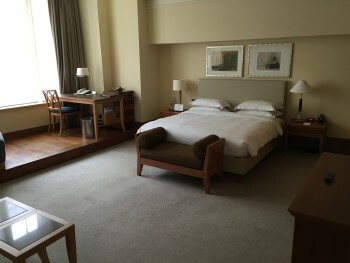 Splurging for a club room, and a deluxe sized one at that, is the best way to get the most of such freebies in my view! You can already book tickets for concerts at the new hall, I believe, starting in the new year, so they’re obviously optimistic. A decent line-up planned, too! If you have a 5 night stay and you use your hotels.com free night to part pay for the stay, does that mean you get 4 nights credit in the hotels.com scheme? Or, given that it is a partial award payment, does that mean you get no credit at all? Why would you do that, even if technically possible? Do a 4 night booking and a separate 1 night free night, just to be sure. Be careful if doing that with Hilton as they will often merge the stays and as a result the whole thing would be non-earning! Safer to not have any HHonors number attached to the booking and to checkout at the end of the paid stay. It worked for me. I booked 3 nights in NYC (as one stay) and paid for one with a free night hotels.com voucher. The other two nights counted towards my next free night. I was pleased to see that the free night voucher paid off the most expensive night of the three, leaving me to pay cash for the two cheaper nights. Which means that the most valuable night was excluded from the calculation of your next reward. Indeed. But I’d rather save the full cash now than save 10% of that at some date in the future. Yes, you would get 4 free nights in the case you’ve described. Sometimes there are promotional rates for staying 4 or 5 nights etc, so you get a lower rate than if you did two separate bookings. 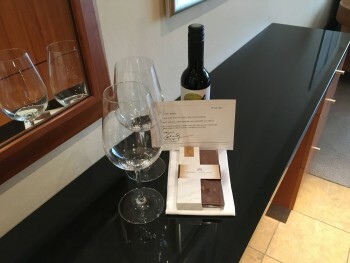 Great to know that Hyatt respect status even when not booking directly. Does anybody know if Hilton do the same? I’m sure that is covered somewhere on HfP, but I cannot find it. We booked the Hilton Bankside in London at a much cheaper rate via Hotels.com – when we checked in we got upgraded to a suite on the executive floor and access to the executive lounge! Booking direct was about £60 pr night dearer IIRC plus we got £24.70 back in cash back! The most important feature… does it have sockets near the bed for your mobile phone?? Not sure actually …. it wasn’t necessary in my case. I know Hotels.com reward nights are valid for one year, but is there an extension possible to that one year, e.g. if you make a booking in between? Yes they get extended. Welcome Rewards night credits are valid for a year from the date of your last night credited. There’s hotels as cheap as £2 in asia you can use to keep nights from expiring. Free nights have no expiry. And there’s no problem with me not turning up if I happen to not be in Asia? A couple of years back I had 8/10 Hotels.com nights, so 2 short. Knowing I had no need to book via Hotels.com for the following year and would lose the credit, I booked 2 nights through Hotels.com in a Mexico City (where I had a hotel stay anyway) hostel at a very cheap rate. I checked-in, paid and never returned. My final two nights’ credit posted and I used my free Hotels.com night. I thought this was safer than booking something cheaper where I knew I couldn’t check-in. With hotels.com you have to have 10 stays within 12 months to qualify for the free night – in the article you mention 10 stays in 3 years and a stay from 2014 counting towards the 10 stays. How do you get 3 years as I have had stays drop off after 12 months? Just looking at my account I have some qualifying stays from January 2015. I think the only reason that they fall off is if you don’t use them for a stay over 12 months, and then having a stay resets the expiry of qualifying nights by 12 months. With hotels.com you have to have 10 stays within 12 months to qualify for the free night – in the article you mention 10 stays in 3 years and a stay from 2014 counting towards the 10 stays. How do you get the 3 year rule to apply rather than 12 months? I have had stays drop off after 12 months on my hotels.com acount. One stay a year stops them resetting. OT: I heard people on here say you can request a “diamond challenge” with hilton. Whats the best way to go about that? And what are they likely to offer me in the challenge? My tracker says I need 24 nights to retain diamond and I don’t think I will manage that. I like diamond… but I can get gold through my Amex platinum. Is diamond worth the hustle? Hilton will status match you directly, no need for a challenge. If you have nothing to match, the challenge is usually pro-rata – you get 90 days to achieve 25% of the annual nights target. Park Hyatt Hamburg is also one of the very few Park Hyatt hotels with a Club Lounge, I think the other 2 are in Australia. I need to go somewhere in Germany in October. I may take a trip to Hamburg. My father went there in 1957 as part of his degree course, so it will give us something to talk about. When I stayed there about 2 years ago at breakfast I recall seeing a wheel of cheese which had the logo of a hemp leaf plastered all over it, any idea what that was about or if they still had it?